When it comes to having an idea for a movie, the journey from dream to screen can often takes years (assuming it’s completed at all). 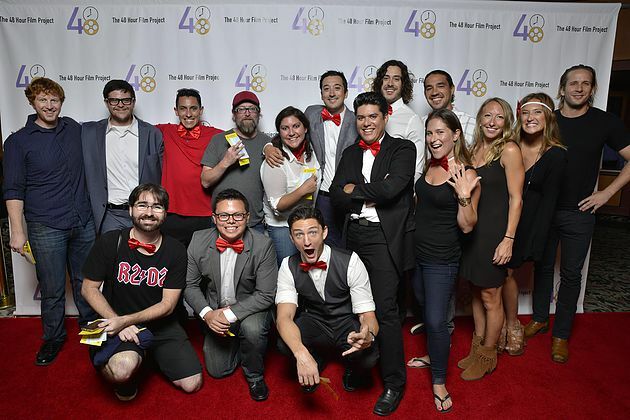 But the 48 Hour Film Project offers the satisfying experience of writing, shooting, and editing a movie in two days and then seeing it projected on the big screen in front of a paying crowd the very next week. Teams that meet the deadline, stay within their assigned genre, and follow the rules of the competition (including a requirement for each film to feature a shared character, prop, and line of dialogue) are then judged by a local panel of experts and awarded prizes like screenwriting and editing software (sponsored by Movie Magic and VEGAS Pro, respectively), with the first place movie from each city earning the right to screen at Filmapalooza — basically the 48 Hour Film Project equivalent of the Oscars crossed with Sundance and the Olympics — where the best of the best compete head-to-head for the honor of being crowned the year’s ultimate winner (like 2018’s “Sonrisita” by the Côte d’Azur team, Barbak&Gougoutte Films). Yet for most teams, the real prize is simply the adrenalin rush and camaraderie of completing the race-against-time challenge followed by the instant gratification of sharing those creative results with fellow filmmakers and enthusiastic audiences. One moment you’re an anonymous movie fan in the dark and the next you’re discussing the inspiration for your Western/horror/superhero film about “Bonnie or Brian Higgins, Inventor” or your motivations behind the role of “Paulette/Pierre Kubiak, Connoisseur” at a post-screening Q&A. For those who’d like to participate, the May 3-5 Boston 48 Hour Film Project is currently registering teams (followed by upcoming filmmaking weekends in Miami/Ft. Lauderdale, Lisbon, San Diego, Lima, Edinburgh, Washington, D.C. and more), and further information about the event can be found at www.48hourfilm.com.